Government and Taxes: Energy 32: Is the PH Power Supply Ready for the AEC? 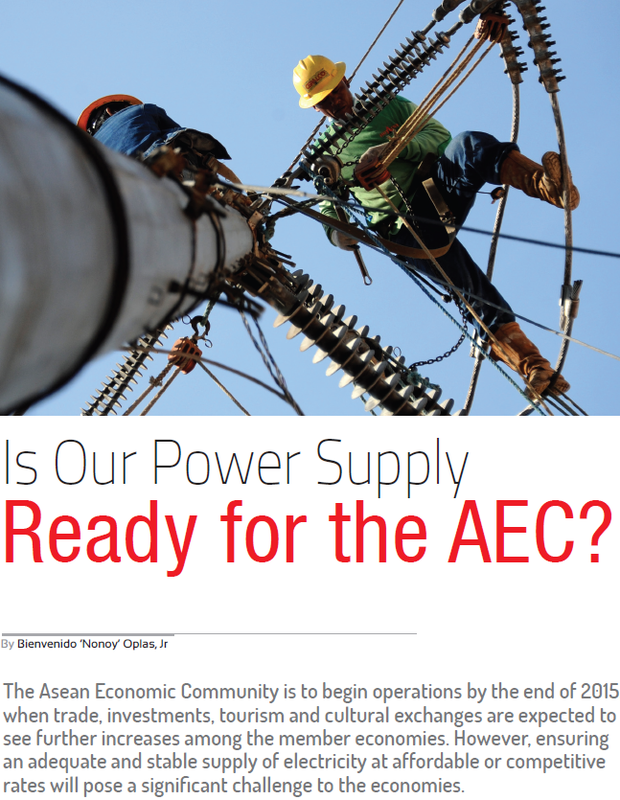 Energy 32: Is the PH Power Supply Ready for the AEC? * This is my article for the maiden issue December 2014 of ASEAN Voices, pages 28-31. It is a new magazine based in Jakarta scouring important news and opinions about the region. The pdf copy is also posted in slideshare. The Asean Economic Community (AEC) is to begin operations by the end of 2015, as trade, investments, tourism and cultural exchanges are expected to see further increases among the member economies. However, ensuring an adequate and stable supply of electricity at affordable or competitive rates will pose a significant challenge to Asean economies. 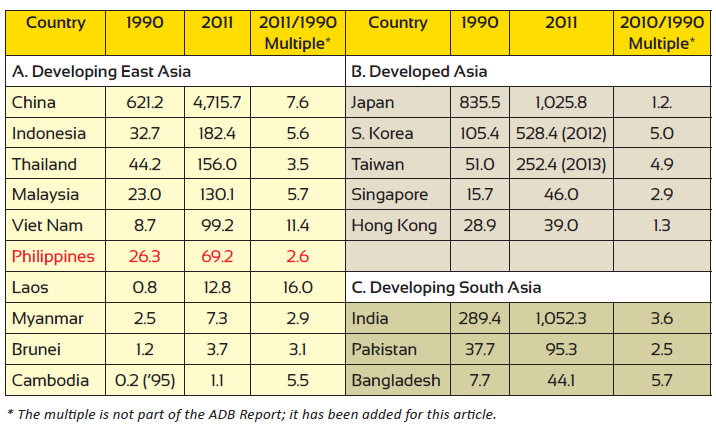 It is generally understood that growth in electricity production in the Philippines has been slower than that of its neighbors in the Asean countries. China, South Korea, Indonesia, Malaysia and Vietnam have expanded their electricity production by five times or more in just two decades, causing some anxiety mixed with optimism, over the potential impact of the region’s fast-approaching economic integration. In the Philippines, a number of reports have claimed that rotating brownouts and power outages will be inevitable in the hot months of March to May 2015, when electricity demand is high and power reserves are thin. The Department of Energy (DOE) has asked Congress to grant President Benigno Aquino the authority to deal with the projected power supply deficit in an emergency. The above medium-term supply-demand outlook for Luzon, the largest island in the Philippines, is based on the assumption that the Required Reserve Margin is a 4% regulating reserve, as well as a contingency and dispatchable reserve requirement. It also assumes that there will be a 4.2% peak demand growth rate in 2015, compared with the current year, based on the observed 0.6 elasticity ratio of demand for electric power, with a projected GDP rate of 7% in 2015. Also, there will be a 4.8% peak demand growth rate in 2016-2020, based on a projected 8% GDP growth rate for this period, and assumed average forced outage or scheduled maintenance, while the monthly percentages of the total available capacity are as follows. However, available capacity calculations and committed projects do not deliver 100% of their rated capacity. Old conventional power plants tend to require more frequent maintenance or scheduled shutdowns, or they suffer from more unscheduled shutdowns. For new renewable sources of energy, such as wind and solar power, their dependable capacity is only some 20% of their rated capacity. Thus, a 100 MW solar or wind plant can deliver only around 20 MW, on average. When there is little to no sunlight or wind, the energy output from these plants is zero or minimal. The DOE's outlook fails to adequately reflect future dependable supply (FDPS), and so, the true gap between peak demand and available capacity/committed projects cannot be effectively addressed. For its part, the National Grid Corporation of the Philippines issues alert levels in cases of power deficiencies. "Red Alert," for instance, means the contingency reserve is near zero, if not negative. Red alerts have already been issued a number of times between June and September 2014, well ahead of the launch of the AEC. Here are some critical periods in 2014, they can give a preview of supply outlook in 2015. 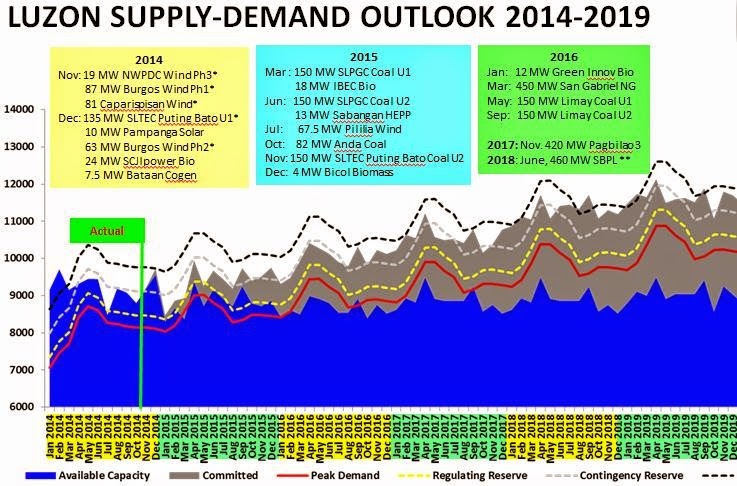 Actual peak demand this year was 8,717 MW, made in May 21, 2014. “Red alert” have been issued on June 17 (natural gas restriction), June 25 (3 coal plants have unscheduled shutdowns, 1 has derated power), and July 12-13 (natural gas pipeline problem). Thin reserves were also experienced last September 8-11 (natural gas restriction), last August 30 - September 28 (Sual coal unit 2 maintenance, 647 MW), September 26 - October 25 (Sual coal unit 1 maintenance, also 647 MW). 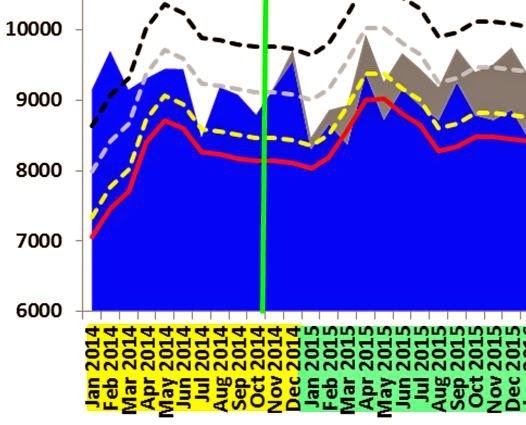 Thin reserves, if not power supply deficit, will be most critical on April-May 2015. But big industrial and commercial consumers have back up power. 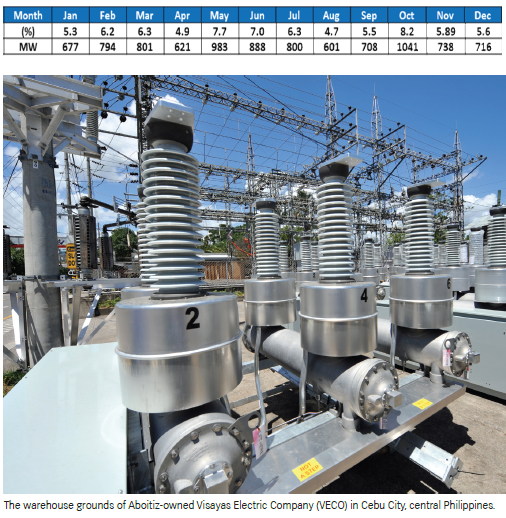 Metro Manila and Luzon provinces are heavily dependent on a number of power facilities, many of which are already more than 20 years old; hence, they either require more frequent maintenance shutdowns or are prone to unscheduled shutdowns. 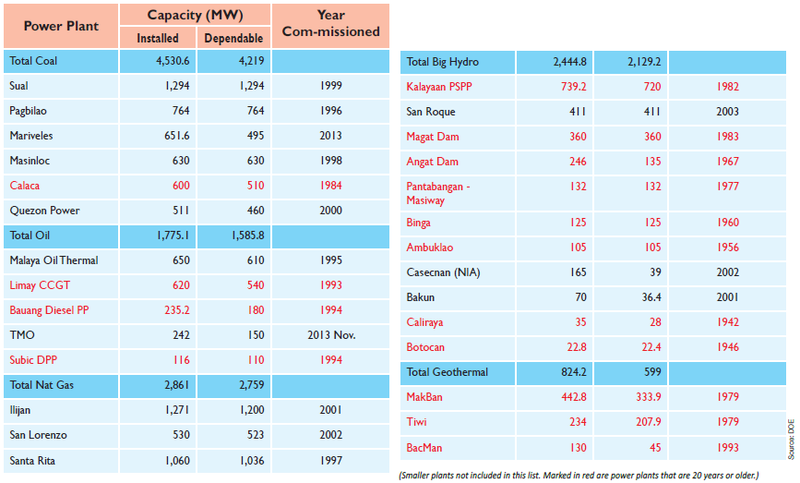 From 2002 to 2013, only one new power plant was commissioned: the Mariveles GN Power coal plant. The oil barge by TMO is an old power plant that had remained inactive for at least five years and was re-commissioned in late 2013, purely to help prevent brownouts during last year's Christmas season. So, is the Philippines ready for the anticipated energy demand surge when the AEC begins operations? If existing and committed power plants are to be relied on, then the answer is no. Many of them are old, and many new plants utilize intermittent sources, such as wind, with low dependable power capacities. If large industrial and commercial consumers use back-up power, as part of the Interruptible Load Program, then the answer is yes. However, the latter would drive up the price of electricity, as these large consumers would use their own generators, and the reduced demand in the national grid would have to be compensated. This would come in the form of higher “universal charges” in succeeding months or direct payments by the DOE, using taxpayers' money. Still, there are a few solutions that could help expand the country’s power supply capacity. First, power companies should bring in more peak-load plants, similar to mobile diesel power barges. The drastic decline in global oil prices presents an opportunity to lower the cost of fuel for these power plants and, in turn, lower their power-generation prices. Second, large industrial and commercial consumers can enter the power-generation business, as well. Third, media campaigns can be run to request the public, households and commercial offices to reduce their power demands by using more energy-efficient lights and appliances. Further, government agencies should limit the bureaucratic red tape involved in getting the permits required to commission and build new power plants. DOE Secretary Jericho Petilla once said that for some projects, about 100 signatures are needed to launch and maintain a single large power plant. Over the medium term, the government should reduce taxes and royalties for power generation, as these impositions significantly contribute to high electricity prices. The natural gas tax, for instance, amounts to 60% of the net price of gas. It is equally important to ensure that the trade of liquefied natural gas, coal and oil among Asean countries is further assisted to help boost national and regional power supplies.